This lovely two bedroom Peyia Townhouse is located on a small friendly development in the popular village of Peyia, not far from the centre of the village. Peyia has a wide range of local amenities including shops, bars, restaurants and local medical centre. The popular tourist resort of Coral Bay with it’s fabulous beaches is only a few minute’s drive away. The property is well presented with fresh neutral decor and good quality finishes throughout. At the entrance to the property is a private driveway. The ground floor accommodation is nicely designed with decorative arches leading to the newly fitted kitchen and charming living room. The stylish kitchen is well equipped with white fitted units, modern worktops and matching splashback plus under cupboard and floor lighting. Appliances include built-in oven, gas hob, stainless steel cooker hood, fridge/freezer and microwave. The lounge and dining area features a wonderful log burner for the cooler months and to the side is a guest WC. An under stairs cupboard is nicely tucked away and provides additional useful storage space. Full width sliding patio doors lead from the living room to a shaded outdoor terrace and fully enclosed courtyard garden, perfect for outdoor dining and relaxing. On the first floor are two good size double bedrooms with fitted wardrobes and each have a private balcony with fabulous coastal and mountain views. A central family bathroom with vanity unit and stylish ceiling spotlights is accessed directly from the hallway. 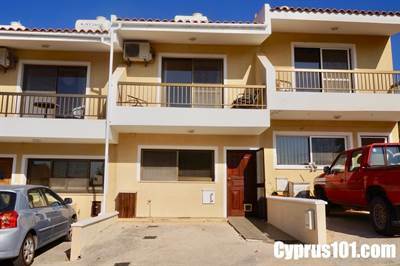 The complex is very well maintained and includes a swimming pool with surrounding sunbathing terrace where you can enjoy the fabulous Paphos sunshine. Suitable as both a permanent residence and/or holiday home, this well cared for property comes fully furnished and has title deeds.